VISITORS to Kinneil House in Bo’ness will take a step back in time this weekend . . . to the sumptuous 17th century. They’ll come face to face with a costumed interpreter playing Anne, Duchess of Hamilton – who played an influential role in the development of the imposing mansion more than 300 years ago. The performances will be some of the highlights of two free open afternoons at the property – which also boasts some of the best renaissance wall paintings in Scotland. The events – on Saturday and Sunday (April 16 and 17) – have been organised jointly by Historic Scotland, which cares for the House, and the charity The Friends of Kinneil. The events will run from noon to 4 p.m. each day, with the last admission at 3.30 p.m.
Maria Ford, the chair of the Friends of Kinneil, said: “We’re pleased to be working with Historic Scotland on a new series of open days at Kinneil House. “You can visit the grounds of the building, and its neighbouring museum, throughout the year. However, access to the interior of the house itself is limited to special open days like this. “As well as the two, free open afternoons this weekend, there are further open days planned on June 26, August 28 and October 30 this year. Gareth Cheeseman, of Historic Scotland’s Interpretation Unit, says: “Anne, Duchess Hamilton, played such an important part in the history of Kinneil House so it’s fitting that visitors hear all about her. “Our talented costumed interpreter will be giving hourly performances to bring her story and the past of this fascinating mansion to life to enhance the tours of the property. Kinneil House is the centrepiece of the magnificent Kinneil Estate, a public park owned by Falkirk Council. The estate features a cottage used by inventor James Watt, the ruins of a medieval church, and remains of a Roman Fortlet – part of the Antonine Wall, Scotland’s latest UNESCO World Heritage Site. 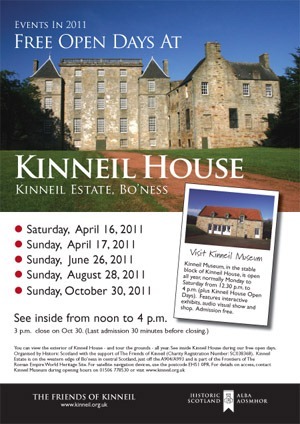 · Kinneil House is located on the western edge of Bo’ness, off the A904 (follow signs for Kinneil Estate and Museum). · Set in a public park, the oldest part of Kinneil House is a 15th century tower remodelled by the Earl of Arran between 1546 and 1550 and transformed into a stately home for the Dukes of Hamilton in the 1660s. · The grounds contain the ruins of James Watt’s cottage and the boiler of his Newcomen Engine. · The history of Kinneil dates back to 1323 when lands were granted by Robert I to Walter Fitzgilbert of Hamildon, the head of the family which later produced the Dukes of Hamilton. The Hamiltons’ main seat was in west central Scotland but over the centuries Kinneil became their base in the east. In the 1400s they built a small tower house here in an easily defensible position overlooking a ravine. In the late 1400s or early 1500s the tower house was enlarged. In 1553 James Hamilton, 2nd Earl of Arran, built a palace to the north east of the tower house to its north east. In 1667, William, 3rd Duke of Hamilton and his wife Anne launched a major expansion of Kinneil House. Within a century, however, the Hamiltons had ceased to use Kinneil, and rented it out to tenants. This entry was posted in Uncategorized on April 11, 2011 by Friends of Kinneil.